Recent data have suggested that the development of multisensory functions follows a protracted developmental time course. One example is the spatial matching of crossmodal input which seems to mature in mid and late childhood. Visual input seem to be essential for a number of crossmodal functions and seem to be permanently impaired if vision is missing for the first month of life. However, some crossmodal recalibration and thus crossmodal learning capacities remain throughout life. 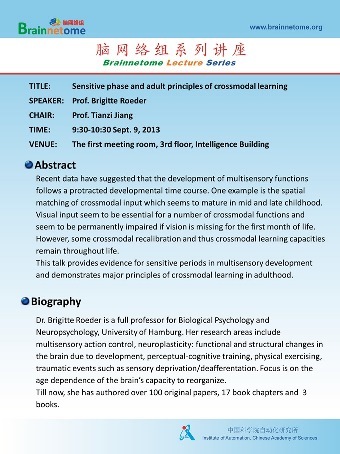 This talk provides evidence for sensitive periods in multisensory development and demonstrates major principles of crossmodal learning in adulthood. Dr. Brigitte Roeder is a full professor for Biological Psychology and Neuropsychology, University of Hamburg. Her research areas include multisensory action control, neuroplasticity: functional and structural changes in the brain due to development, perceptual-cognitive training, physical exercising, traumatic events such as sensory deprivation/deafferentation. Focus is on the age dependence of the brain’s capacity to reorganize. Till now, she has authored over 100 original papers, 17 book chapters and 3 books.